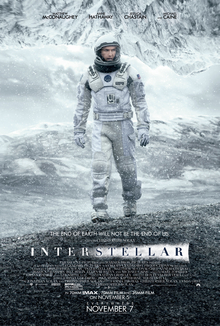 Interstellar is a 2014 epic science fiction film co-written, co-produced and directed by Christopher Nolan. The film stars Matthew McConaughey, Anne Hathaway, Jessica Chastain, Matt Damon, and Michael Caine. In the film, a crew of astronauts travel through a wormhole in search of a new home for humanity. Brothers Christopher and Jonathan Nolan wrote the screenplay, which has its origins in a script Jonathan developed in 2007. Nolan produced the film with his wife Emma Thomas through their production company Syncopy and with Lynda Obst through Lynda Obst Productions. Caltech theoretical physicist Kip Thorne, whose work inspired the film, was an executive producer and acted as scientific consultant. Later, he also wrote a tie-in book, The Science of Interstellar. Warner Bros., Paramount Pictures, and Legendary Pictures co-financed the film. Cinematographer Hoyte van Hoytema shot the film on 35 mm (in anamorphic format) and IMAX 70 mm. Principal photography commenced in late 2013 in Alberta, Iceland and Los Angeles. The film utilized extensive practical and miniature effects, while Double Negative created additional digital effects. Interstellar (2014) - Scene “Messages span: 23 years"
Interstellar (2014) Matthew McConaughey, Anne Hathaway, Jessica Chastain https://www.imdb.com/title/tt0816692.